Translation ｜ When it comes to multilingual/patent translation, IIS is here to serve you. We cover a wide range of business categories in 40 languages. Our translation services are classified into five key categories; “patent translation,” “science and technology translation,” “legal affairs translation,” “environment-related translation” and “general translation.” Translation in any classification/area is provided based on our multilingual full-time field-based system. In global corporate activities, the importance of strategies for intellectual property rights has grown significantly. The close coordination among the patent authorities in Japan, the US and Europe is a symbol of this growth. A company usually obtains an international patent after repeated responses to OA (office action) with the authorities of a country where the patent is applied to. Depending on circumstances, the company may assign the patent right to other companies, permit the use of the right or respond to patent infringement by other companies. Translation that involves the intellectual property strategies of various companies requires a wide variety of segmentalized and specialized technical knowledge and quality control ability. For many years, IIS has been offering patent translation in the areas of chemicals, medical products, biotechnology, machinery, electricity, electronics, semiconductors, OA, automobiles, information, communication and business models in the case of overseas applications by Japanese companies and from prior art search to application documents, office action, reason of rejection, cited reference, opinion, written reply and intermediate action (including appeal/trial decision) in the case of domestic applications by foreign companies. Patent translation has certain patterns and writing rules that must be observed without fail. Depending on the intended purpose, one needs to translate an original text by understanding the technical content accurately in addition to being familiar with different written systems. One sometimes needs to translate it while supplementing descriptions with additional explanation or correcting mistakes in the original description. Or, one may have to translate it in a faithful and accurate manner without tampering with original sentences. Therefore, patent translation requires not only a wide range of specialized technical knowledge but also descriptive ability in accordance with the purpose of the application or the customer’s intentions as requested (e.g. for reference/understanding of the content), and overall quality control is important. *IIS uses a full-time field-based translation system. 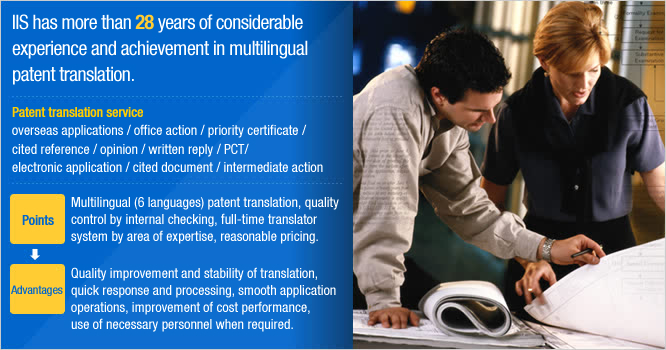 IIS has more than 28 years of considerable experience and achievement in multilingual patent translation. Translation in the area of science and technology is complex and wide-ranging as it deals with rapidly evolving R&D and various new products and services being created with new technologies. IIS offers multilingual translation of materials in use, safety data sheets, various types of test reports, operating instructions, technical standard manuals, certificates, etc. It seems that science and technology have begun to be linked together with the global movement of setting environmental standards. IIS has been highly trusted in its legal translation from Japanese companies, foreign-affiliated companies in Japan and overseas companies. In our legal translation, the number of orders from legal professionals, legal offices and corporate legal affairs departments in and out of the companies is increasing each year and the repeat rate remains very high. Requests for multilingual translation in the areas of compliance and “corporate principles and codes of conduct,” which have become particularly important in recent years, are increasing in addition to other areas in articles of incorporation, copies of company registers, employment regulations, minutes of board of directors/shareholders’ meeting, various types of letters of agreement, contracts, memorandums and certificates. The importance of disclosing corporate financial information is increasing along with the global restructuring and diversification of financial procurement by companies inside and outside of Japan. In line with these circumstances, we have extensive experience in the translation and design of catalogues for issuing stocks/bonds and the outlines, financial reports, earnings briefing, financial statements and annual reports. Various environmental initiatives are in progress in each country, and the introduction of the RoHS and REACH directives recently became hot topics in Europe, the US and China. The number of orders for the translation of CSR reports and environmental financial reports, which reflect the activities of domestic and overseas companies adopting advanced environmental management, is increasing. As a preferable choice by many companies, our multilingual translation service is also helping them to formulate future environmental measures. IIS adopts a translation process called “document engineering” for each step from the receiving an order of translation to its delivery. The quality control process is different when translating a document from Japanese into a foreign language (requiring proofreading by a native staff) and from a foreign language into Japanese. Furthermore, the initial processing is also different when we receive an original document at the time of order placement, depending on whether it is a paper-based document sent by fax or delivery service/mail, text or Word file by e-mail or PDF file. The pre-processing or post-processing handling of translation also differs according to whether the original document contains figures, tables, chemical and calculating formula. We employ operating process controls based on the document and instructions provided. *IIS adopts a full-time field-based translation system. IIS works hard on quality control by using in-house checkers (proofreaders) and outside checkers (including native staff for each language). We do not ask for special fees relating to the difficulty level of documents or delivery date. We only confirm the minimum delivery time necessary for translation at the time the order is received. If you wish to obtain an estimate for website translation, please send us a printout of the pages subject to translation (all) or let us know the URL for the site. The above standards are only rough guides. If you send us a document at hand that requires translation by e-mail or fax, we will offer you an accurate estimate. We will strictly keep confidentiality of the document. Please feel free to inquire. For payment, we ask for cash on delivery only for first-time clients. We will inform you of the translation fee before tax after completing the translation work and deliver the translated documents by the designated method after confirming the payment to our bank account.